Hurricane Sandy pummeled New York City almost five years ago today. Since then, the built environment has undergone substantial changes. 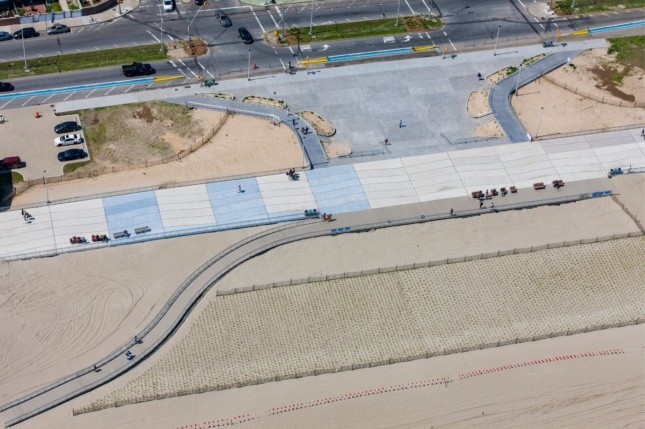 The Architect’s Newspaper (AN) reflects on those first few months post-Sandy, and looks at some initiatives that are reshaping the city to withstand future storms. Shortly after the storm, AN editors reflected on the extent of the infrastructural damage in a heatless Tribeca office. Though uncomfortable, the office was more habitable than many coastal neighborhoods, including Red Hook, Brooklyn, and Breezy Point, a Queens neighborhood at the tip of the Rockaway peninsula that was gutted by fire. In NYCHA developments citywide, 80,000 tenants were without heat or electricity for weeks, the result of floodwaters that topped 11 feet. After assessing the scale of destruction, FEMA updated its flood maps, a reflection of the epic scale of destruction, adding 35,000 structures to Zone A, areas most likely to be impacted in a major storm. The total scale of the loss was great; in New York and New Jersey, 182 people died, and the Northeast coastline sustained $65 billion in damages. In the months afterward, the Department of City Planning presented a guide to storm-proofing buildings. A little more than a year later, the Department of Buildings released building codes for new residential construction and apartments over five stories to make it easier for people to stay in their homes in the event of a severe storm. Architecture for Humanity and AIA New York rallied designers to help with relief efforts, and Garrison Architects was just one firm to answer the call to action. 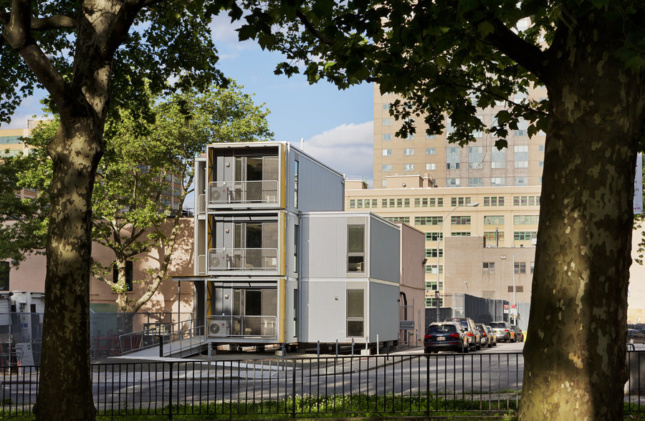 The architects, known for sustainable modular buildings, erected a prefabricated emergency housing prototype in downtown Brooklyn that still stands today. In June 2013, state, local, and national stakeholders launched Rebuild By Design, a federal competition to design more resilient coastline in New York City and the tri-state area. In August 2013, then-HUD Secretary Shaun Donovan announced 69 rebuilding initiatives designed to stitch New York’s built environment back together and prepare infrastructure for future floods. Flooding put the subways out of commission, and repairs to the heavily damaged L train tunnel will suspend Brooklyn-to-Manhattan service for 18 months, starting next year. The storm exposed the vulnerability of New York’s aging infrastructure, but it also created a space for art and reflection. Situ Studio salvaged boardwalk planks from New York and New Jersey for Heartwalk, its Times Square Valentine’s Day installation. MoMA PS1 opened a pop-up geodesic exhibition space in the Rockaways in April 2013 as part of EXPO 1: NEW YORK, showing museum-solicited ideas on transforming the city’s waterfront. Architect Roderick Wolgamott-Romero built a massive treehouse from Sandy-felled oaks at the Brooklyn Botanic Garden. This is by no means a comprehensive look at the thousands of initiatives, local and national, that have shaped the city in the five years after Hurricane Sandy. Below, we scan some initiatives that are remaking the built environment. For housing, Build It Back is one of the city’s key programs to quickly rebuild dwellings in waterside neighborhoods post-Sandy. So far, the city reports its Build It Back program has completed repairs on around 7,200 structures, or 87 percent of the housing in the program. Since its launch in 2013, the program has rebuilt almost 1,400 of the most severely damaged homes, raising them on stilts above the floodplain. Another 6,500 homeowners, many without flood insurance, received reimbursements for repairs and technical support. Though the city is close to reaching its goals, last year the program’s creator slammed Build It Back as a “categorical failure,” largely because it didn’t get residents back in their homes quick enough. DNAinfo reported that Gair questioned the government’s capacity to set up “what amounts to a multi-billion dollar corporation” in a few months to speedily re-home people. 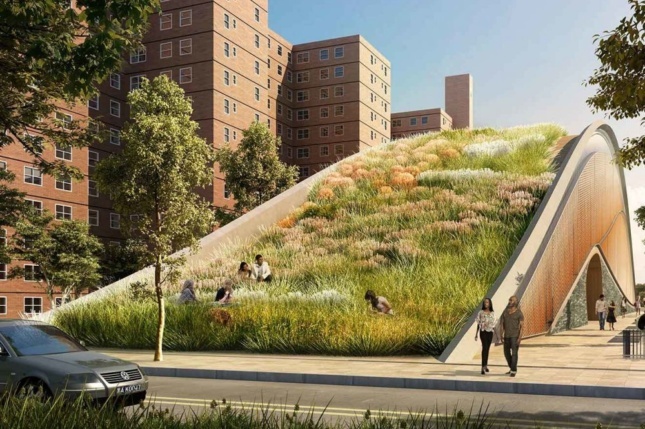 At that time, Mayor de Blasio stated that the program’s work would be complete by the end of 2016. Today the Daily News reported that almost one-fifth of the 12,000-plus families in the program are still waiting for a buyout or work to wrap up on their properties. 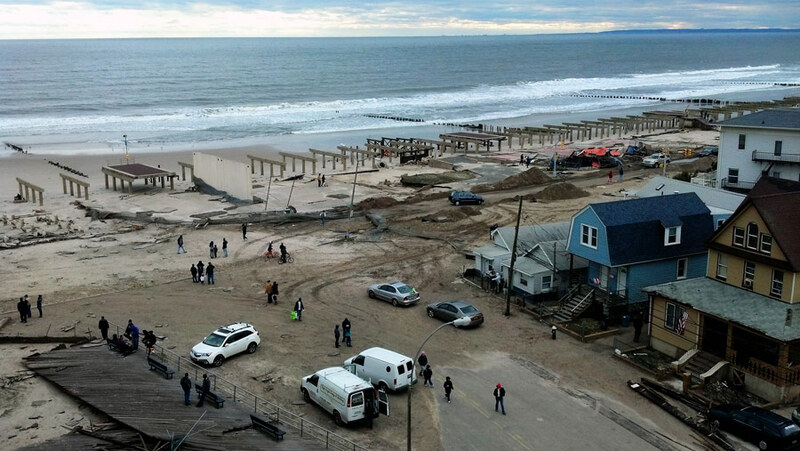 All along the city’s 520 miles of coastline, new dunes, bulkheads, and sea walls are intended to prevent the catastrophic flooding that characterized Sandy. Even with the latest interventions, is New York City really prepared for another superstorm? While offering hope for a more resilient future, new climate projections sow doubt on the city’s viability over the next century and beyond. A new study from the Proceedings of the National Academy of Sciences suggests that floods that with a high-water mark of 7.4 feet could hit the city once every 25 years, and the same level of floods could come as frequently as every five years between 2030 and 2045. Superstorms could be more intense, but modeling indicates that they would move further offshore. In response, the city is tackling the Lower Manhattan Coastal Resiliency Project, a plan to flood-proof Manhttan’s east side. The U.S. Army Corps of Engineers is erecting flood protection on Staten Island’s east shore, and it is planning to build a barrier in Jamaica Bay, Queens. The Governor’s Office of Storm Recovery is spearheading the Tottenville Shoreline Protection Project and Living Breakwaters, two resiliency strategies at the southern tip of Staten Island. None of these massive projects have yet broken ground.